For Stan Palys playing baseball wasn’t just a career, it was an odyssey. An odyssey that began in Carbondale, Pennsylvania, in 1950 and — with MLB stops in Philadelphia and Cincinnati in between — took him to Schenectady, Syracuse and Terre Haute; to Charleston, Birmingham and Nashville; to Corpus Christi, Puerto Rico and Panama; to Spokane, Hawaii and finally to Japan, where it ended 16 years later. Palys was born May 1, 1930, in Blakely, Pennsylvania, a football-crazed coal town just 14 miles from Factoryville, the home of Christy Mathewson. In high school, Palys, class of 1948, wanted to play football for the legendary Blakely Bears, two-time undefeated champions of Eastern Pennsylvania. Since he was 6-2 and 190, the Bears wanted him, too. However, Stan’s father, a Polish immigrant, wouldn’t sign off, even after the coaches came to the house to plead. So Stan focused on baseball and was local all-everything. After high school, the Phillies gave him a $500 signing bonus and assigned him to Carbondale, a Phillies D level affiliate in the North Atlantic League just seven miles down US 6 from Blakely. “I liked playing in Carbondale. I lived at home and I think that was an advantage. I rode to Carbondale games with John Gallis,” Stan said.1 Gallis was a catcher lived in nearby Dickson City. Palys knew something about flying balls. That season with Carbondale, he was second in the league in home runs, two behind the leader, despite playing 20 fewer games. Being among the league leaders in batting stats was the start of a trend for Palys. In 1953, he was fifth in homers with 22 and fourth in doubles with 35 playing for Spokane in the Western International League, while hitting .331. The following season he would finish second in batting at .316 and third in home runs with 14. With the Phillies in spring training in Clearwater in 1954, Stan hit well. However, when the Phillies went north, they kept outfielders Richie Ashburn, Del Ennis, Johnny Wyrostek, Danny Schell and Mel Clark, sending Palys further north to New York State. Splitting time between Schenectady of the Eastern League and Syracuse in the International League, Stan hit .291 with 22 doubles and 17 home runs and was named the Eastern League All-Star center fielder by the managers and writers. Again, he was called up in September, and again he got into only two games, going 1-4 with a single and a walk. Stan’s break came in the spring of 1955. He was slated to go back to Syracuse, but after Ashburn and Ennis both got leg injuries in a spring game against Yankees in Wilmington, Palys was the opening day starter in left field. It was thought he’d go back to Syracuse when Ennis returned, but manager Mayo Smith liked Stan, so he moved him to right when Ennis came back. On April 13, in a game where Robin Roberts pitched a no-hitter for 8 1/3, Stan had a key RBI in a 4-2 win over Giants. When Palys got to Cincinnati, the Reds had two entrenched outfielders in Gus Bell and Wally Post, who both played in all 154 games in center and right. Bob Thurman was the left fielder, and Stan was a pinch-hitter until late June when the Reds tried a platoon in left with Stan and Thurman, until Stan won the job by hitting in nine of ten games. However, on August 17, he injured his hand sliding into second base. He missed two weeks and made only one start the rest of the season. In 79 games with the Reds, he hit .230 with 14 doubles, seven home runs and 30 RBIs. He also led the league in outfield fielding percentage at .993, making one error, though he did not play enough to be listed as the official league leader. In the spring of ’56, he made a bid to reclaim the starting left field job. He was 4-for-5 on March 17, hit a home run and triple on March 24 and another home run the next day and a home run on April 8. However, a rookie named Frank Robinson emerged, played 150 games in left, and won Rookie of the Year. Robinson’s emergence relegated Stan to pinch-hitting. He got in only 40 games with just six starts. He also started an exhibition game in Kansas City on May 24 and hit a 3-run home run off Tommy Lasorda in the 7th to beat A’s 3-2. On August 2, replacing a slumping Post in right, Stan went 5-for-5 with home run in a 10-2 win over the Giants. When he went 0-for-4 the next day, the Reds went back to Post. On September 25 he grounded out to third pinch-hitting for shortstop Roy McMillan in what turned out to be his last Major League at-bat. He was 25. He was finished as a Major Leaguer, but far from finished as a professional baseball player. He played nine more seasons tearing up leagues from the Deep South to Hawaii to Japan. In 1957 in Nashville he hit .359, two points behind leader Peanuts Lowery. He was third in doubles (34) and fourth in homers (24), five behind Harmon Killebrew, and tied a league record with home runs in five consecutive games. In 1960 with Birmingham, he was the American Association MVP. He flirted with the Triple Crown and wound up leading the league in batting at .370, doubles with 43, triples with 13, while finishing second in home runs (28) and third in RBIs (116). He hit one of longest home runs in league history, only the third over the Rickwood Field center field fence in 10 years. His two hits on the last day of the 1960 season gave him 200 for the season, the first time it had been done in the AA since 1946. He followed that up, hitting .333 in 1961 and leading the league in RBIs with 114. In 1962, he signed with the LA Angels and was assigned to the Hawaiian Islanders in the Pacific Coast League. Hawaii’s PCL schedule alternated two weeks at home and then two weeks on the West Coast of North America playing in California, Oregon, Washington and Canada. In May of ‘62 with Hawaii, he went 21 for 48 in a 12-game hit streak. In June and July, he hit in 21 of 22 games with six homers and 13 RBIs in one 11-game stretch. He was the PCL Player of the Month for July and June. On August 29, the Islanders held Stan Palys Night, and he was given $3,700, several bonds and merchandise. Many donations came from friends in the Scranton, Pennsylvania, area. He said thank you by hitting five home runs in the final series against Seattle, to finish with a Hawaii team record and league-leading 33 home runs. He was third in batting at .332. and RBIs with 91. He was selected league MVP and the top outfielder over all AAA leagues. 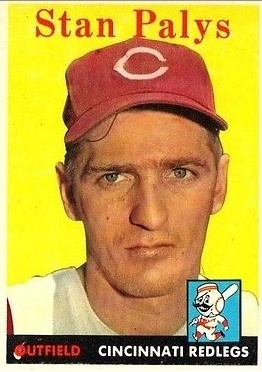 Despite his huge minor league numbers throughout his career, Stan never got another call-up after playing for the Reds in 1956, but he isn’t bitter about it. “It was a numbers thing. There were a lot of outfielders with good stats to choose from and those guys Bell, Robinson and Post were really good players,” Stan said about when he was in the Reds organization. The same was true when he was sold in 1958 to Detroit, who had Rocky Colavito, Al Kaline and Charlie Maxwell. With the Angels organization in 1962 he might have been a third option after Leon Wagner and Albie Pearson, but by then he was 32. The Angels kept him in Hawaii for 1962 and ’63. On February 6, 1964, after two months of negotiations, the Tokyo Orions in the Japanese Pacific League purchased his contract from Hawaii for $7,000. He was the first player to have his contract purchased by a Japanese team. Other Americans had gone there as free agents. Stan flew with his wife Suzie and young sons, Stan and Steve, from Scranton to Hawaii and signed a two-year contract with the Orions for $40,000. After playing two exhibition games with the Orions in Maui on February 22 and 23, the family flew with the team to Tokyo. Stan’s first son Stanley was born in Panama, where Stan played winter ball in 1959-60 and ’60-’61 for the Marlboro Smokers. In the first season there, he led the league in home runs and RBIs with 10 and 30 in 37 games, hitting seven home runs in six games. The Smokers won the Panama League and reached the finals of the Caribbean championships where they finished second to Cuba. Stan’s next three sons were Stephen, born in Alabama in 1961, and Ken and Michael, born in Japan, where Stan played four seasons 1964-67. In 1964, Stan was second on the Orions in home runs (17) and RBIs (70) and was eighth in the Pacific League in both. In 1965 despite missing 29 games, he led the team in home runs (25) and RBIs (72) and was fourth and sixth in the league in those categories. In 1966, he was second on the team in home runs (18) and RBIs (69). Stan and his family stayed in Japan in the off seasons. Though he enjoyed playing there, he said his wife acclimated to the culture better than he did. As the only American on the team, one thing he didn’t enjoy was life on the road in Japan. On the Orions first road trip, he took one look at the barracks-like sleeping quarters with cots lined up in an open room and demanded a hotel room. Stan estimated there were four to six players on average per team that could have played in the major leagues. As a 6-2, 190-pound American, Stan stood out in Japan, but he found the people respectful, courteous and eager to please, to a fault. When he got lost driving and asked for directions, people would point in the wrong direction instead of saying they didn't know. After the 1967 season, Stan retired and went back to Pennsylvania, got a degree in business at the University of Scranton and then he went on to work at the local Intermediate Unit, a system for mentally disabled children. He and Suzie had one more child, Trish, who was born in Pennsylvania. Stan and Suzie split up, and she moved to Jupiter, Florida, in 1978. Stan moved to Jupiter in August 2013 to live with his son Steve. 1 All quotes by Stan Palys come from a phone interview in August 2013. 2 The Sporting News, October 7, 1963. 3 All quotes by Michael Palys, came from a phone interview in August 2013 and emails from him in August and November 2013.